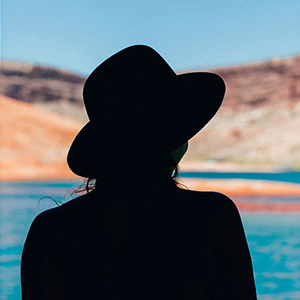 My name is Ariella, and I am the Teen Services Librarian for the Gillis, Selma, Fowler, Kingsburg, Caruthers, Easton, Laton, and Riverdale branches. I am a proud nerd who enjoys many different fandoms, and any excuse to bring those fandoms into my libraries! I love to cook and travel, and I enjoy learning about history. I have a little Pomeranian named Kyubi; he is one of the most spoiled dogs on the planet, but he gets by with it because he’s cute. Fae is a Fresno Native and a proud Fresno State alumni, as well as a current graduate student. She received her B.A. in Political Science from Fresno State, her M.L.I.S. from San Jose State, and is currently working on her EdD in Educational leadership from Fresno State. Fae has been a staff member at Fresno County Public Library since 2016 when she started in W.O.W department. 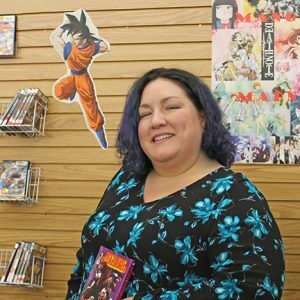 She now works as the Youth Librarian for the Central and West Fresno branches. Fae is a media fanatic and loves books, music, movies, podcast, and art. Working in a public library is a dream surrounded by all these stories is a dream come true for her and she always looking for a few suggestions for something new. When Fae isn’t wandering through the stacks looking for something new to read you can find her at Fresno Grizzlies games or exploring downtown Fresno. Hi, my name is Michelle, and I’m the Teen Librarian for the Blossom Trail Cluster, which includes the libraries of Bear Mountain, Orange Cove, Parlier, Piedra, Reedley, Sanger, and Sunnyside. I grew up in Porterville, CA, where I attended Porterville College and earned my A.A. in English. Then, I went to Fresno Pacific University, where I received my B.A. in both Social Sciences (Pre-Law emphasis) and Classics. Next, I earned my M.A. in Information Resources and Library Science from the University of Arizona in Tucson, Arizona. I love reading, learning new things, and playing games (PC, console, board, and tabletop). My favorite books at the moment are the Harry Potter series, The Maze Runner series, and The Hunger Games series, as well as anything by Anne McCaffrey and Stephen King. I enjoy conversations about Star Wars (especially the game Star Wars: The Old Republic), anime, manga, Scrabble, current theatrical movies, and what everyone is reading. Hey, I am the teen librarian for the Sierra Gateway cluster, that is Auberry, Betty Rodriguez, Big Creek, Clovis, Mosqueda, and Shaver Lake libraries. The library is an amazing place to work, and even a more amazing place to be, we are here just for teens. My job is to listen to what you want to do here at the library and make it happen, to the best of my abilities. Slime in the library, done! Life size games, done! College and Career Day, done! Random fact about me…I love to go SCUBA diving and rappelling. Ask me about diving in black water or rappelling down a waterfall! My go to books are anything by Tamora Pierce, Sarah J. Maas, Rainbow Rowell, and of course, the Harry Potter series! Come check out some of the cool things that are happening at my libraries! Hello! My name is Catherine and I am the Teen Librarian for the Cotton Fields Cluster which includes Fig Garden, Kerman, Mendota, San Joaquin, Tranquillity, Firebaugh, Biola and Teague libraries. I was born and raised in Selma, CA and after I graduated from high school I went to UC Santa Cruz where I received a BA in Anthropology. After working in the Monterey Bay Archaeological Archives for two years I became interested in the information science profession. I went to San Jose State University were I got my Masters in Library and Information Science. After I completed my degree I began my job search and was hired by the Fresno County Public Library. I am happy that I was able to find a job close to home and I am excited to be helping make Fresno and the surrounding areas a better place. Annika is part of the WoW! (WithOutWalls) mobile library team, with a focus on Youth Services. She loves connecting people with the many resources available through the library. As a community librarian, she travels all over Fresno County visiting schools and talking to students, teachers, and families about library services. 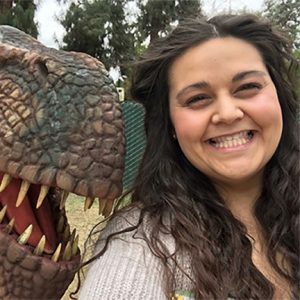 I am the teen programming librarian for Fresno County Public Library – meaning I come up with fun and exciting programs for all of Fresno County! When I am not thinking of the greatest puns ever, I like to spend my time arguing about comic books, tracking the movements of the best shark around (Deep Blue, a 20 foot beaut! ), and yelling out dog every time I see a dog (just to make sure the dog knows that they are a dog – and to let everyone else know that there is a dog present). I like a lot of nerd stuff, and that definitely shows in my programming ideas – Ravenclaw for life! If you see me out and about, say hi – give me a great book recommendation – tell me the best joke you’ve ever heard! My favorite (so far) – what is a pirate’s favorite letter? You may think it is “R”, but a pirate’s first love is the C.
It all began when Thomas started volunteering for Fresno County Public Library’s Reedley branch in 2010. Volunteering at the Library was an amazing experience, but when Thomas heard about a job opening for Library Assistant the following year, he practically leapt at the opportunity. From there, he’s had the privilege of serving local Library-goers in a variety of different capacities. Currently, Thomas is part of the behind-the-scenes team of staff that orders new books and media for the Library’s many branches. He spends much of his work time selecting titles that will help meet the recreational and informational needs of the community, and his main areas of focus are teen and kids’ books, graphic novels and manga, eBooks, and video games. He suspects that this might actually be the best of all possible jobs. When he’s not at work or writing autobiographical blurbs about himself in the third person, Thomas is (and this might fall somewhere in the region of complete shock, or maybe absolute shock) pretty big into reading! He usually gravitates toward fantasy, sci fi, comics, and Stephen King, but he’ll read just about anything. A few of his recent YA favorites include Joe Abercrombie’s Half the World and Ryan North and Erica Henderson’s run on The Unbeatable Squirrel Girl.